Iran has been receiving much attention, including a proposal for détente, from the Europeans and the U.S. Envious of that kind of play, “Dear Leader” declared he was going ballistic! After decades of practice, North Korea is skilled at producing statements that are sure to ruffle feathers and grab attention. To an untrained ear, these belligerent words sound like air raid sirens. But he is not suicidal. And all he wants is some T.L.C., phone calls and peace and quiet in his backyard. There are some things the U.S. can do to overcome this largely political hurdle. It would not be surprising if Iran has taken a chapter or two out of North Korea’s playbook on effective propaganda and war-mongering in order to raise its bargaining position. Iranian President Mahmoud Ahmadinejad appears to have adapted North Korea’s tactics to his own needs. Instead of the overplayed “Great Satan,” he took a swipe at Israel. When the U.S. largely ignored it, Iran pressed further. The most bizarre part about the new tactics was literally the song and dance that accompanied the celebration of its Uranium enrichment program. 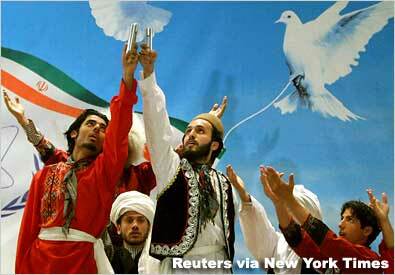 The photo below shows men in traditional clothing dancing against the backdrop of doves tugging on an Iranian flag with the universal nuclear symbol. The two men are holding metal canisters of enriched Uranium (maybe). Even by North Korean standards, this seems over the top. What does Kim Jong-Il want? North Korea’s announcement about the possibility of a long-range missile test is rooted in five key reasons. Kim Jong-Il would like some tender loving care from the Bush administration and have some of its phone calls returned. “Dear Leader” may be under intense pressure from the military to get on with testing and improving its Tae-Po-Dong II series long-range missiles. When was the last test? Exactly! Plus, not all factions in the military support him. Pyongyang knows how to manipulates the world press and the Bush administration into giving it more leverage at negotiating tables. Kim Jong-Il needs to appear strong to survive a possible coup against him. Rumored assassination attempts and public protest against him follow reports of increasing instability there. North Korea is desperate for food, money and stability, which they will never receive or achieve with their black-market economy. The Bush administration’s playbook on North Korea has been very inconsistent and dictated more by political considerations than by strategic needs. That approach follows precedents set by this group of policymakers. Stop playing into Pyongyang’s propaganda machine. North Korea may very well test a long-range missile, but it is not suicidal. By responding instantly to the North Korean threat, the U.S. ceded control of the play and credence to Pyongyang. Remember that much like President Bush, Kim Jong-Il is under intense political, social and military pressure. Mr. Kim is most likely the lesser of two, possibly three or more, evils. Waste little time, as the succession struggle intensifies in Pyongyang, and bear in mind the inconvenient timing (Israeli elections) of the progress made by Arafat, Barak and Clinton in 1998. North Korea’s greatest advantage is its insular nature. Exclusionary policies rarely work. (e.g. Cuba and the Oil for Food program) Be the first to break down the wall and catch them off guard. Prevent the North Korean economy from going further underground, as seen in smuggling and counterfeiting. Force them to make money off of transparent trade, which will also quiet hard-liners in the military and weaken the post-Kim Il-Sung, neo-conservative elite. Do not use this as an opportunity to test the missile defense system. As the Pentagon is painfully aware, the chance of a successful intercept is very low. If it fails, then it could undermine (or expose) the uncertain technology and impact funding. To maintain (or build) strategic advantage, do all this before the Chinese, Europeans or Russians are forced to step in. One advantage now is that Pyongyang still wants the U.S. and no one else to be its patron. Use it. Other issues? Get over it! I got over the Koreagate, the Iran-Contra Affairs and the 1993 World Trade Center bombing. The Cold War is over. Woolsey and Wolfowitz lost. The Bush administration should also not be tempted to create a theoretically manageable skirmish to divert attention from problems plaguing it. U.S. troops in Okinawa cannot reach safety that fast.